Ric Flair Deadlifts 400 Pounds at the Age of 67. How About You? Watch 67 year old legend Ric Flair deadlift a lot more weight than you can. In case you do not know, Ric Flair, also known as the “Nature Boy”, is a WWE Hall of Fame (World Wrestling Entertainment) superstar. Many wrestling fans believe that 16-time World Champion Flair is the ‘God' of Wrestling, even above Hulk Hogan. In fact, he is considered by many to be the greatest professional wrestler of all time. Flair won 16 world wrestling championships during his 40 year career. It is great to see that Ric Flair is doing his best to stay in shape over the age of 60. And as we know, what simpler way is there to stay lean, fit and strong than the deadlift? Some have commented that they did not think that Ric was deadlifting 400 pounds because his right arm was bent. Anyone who deadlifts knows how dangerous it is to try and curl a deadlift. Never ever attempt to curl the deadlift. Therefore, you always want to keep your arms straight. The fact that his arm is not straight is because that is how his arm extends. This is what I choose to believe and it would be great if Ric Flair would weigh on this himself. Otherwise 400 pounds would cause his arm to fully extend if it could. Give him a break, he is 67 years old! Back in the last century, many wrestling fans thought of Hulk Hogan vs Ric Flair as the Super Bowl Match of Wrestling. Are You Too Old to Deadlift? Of course the answer is no. You just watched Ric Flair deadlift over the age of 65. When you finish this post, come back and watch Shirley Webb deadlift 255 pounds at the age of 80! 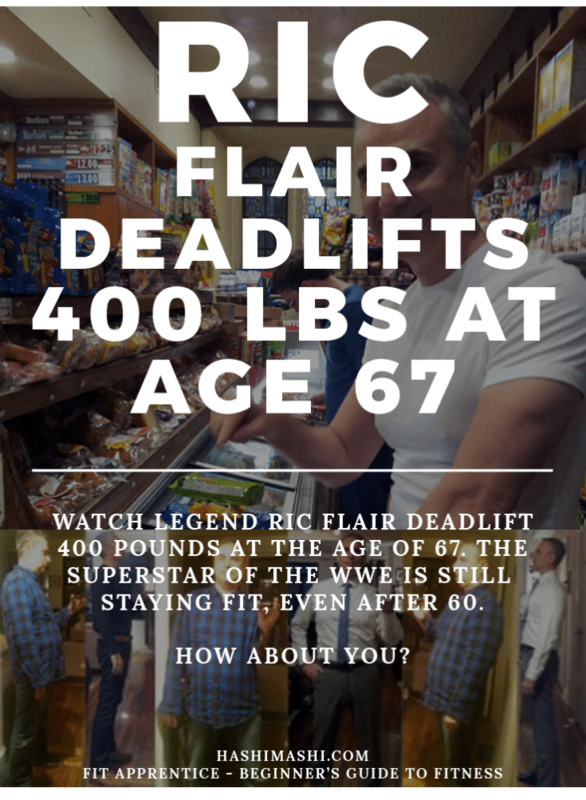 No matter what, whether Ric is deadlifting 400 pounds or 300 pounds with lighter bumper plates, they are both still a tremendous amount of weight to deadlift. But do not try to deadlift at home yourself without the right deadlift training. It is great to see that Ric Flair is deadlifting and staying in the game and doing his best to stay fit over 60. You see for yourself that even over the age of 60, your body is capable of staying fit and strong. This should motivate you to get into better shape if you need to. Your age is not an excuse. Take care of yourself and learn how to get leaner and stronger no matter what your age. And of course, learn about the off the chart benefits of deadlifts and how to deadlift safely. And then start deadlifting to get fit and strong, even if you are over 60 yourself. What do you get out of seeing a Ric Flair deadlift? Next read these articles – How the Deadlift Can Transform Your Body and the 39 Best Deadlift Tips for Beginners.